Description: Dolley Payne Todd Madison (May 20, 1768 - July 12, 1849) was the spouse of the fourth President of the United States, James Madison, and was First Lady of the United States from 1809 to 1817. She was notable for her social gifts and helped define the role of the First Lady. Her success as a hostess contributed to increasing the popularity of Madison as president. She also aided in the completion and furnishing the interior of the newly constructed White House. 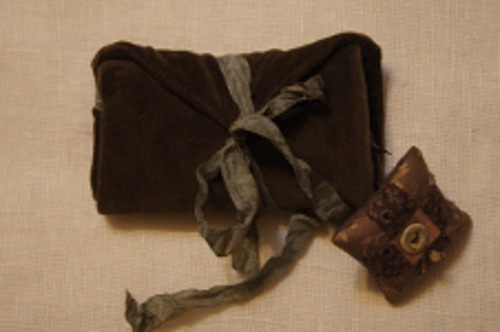 This sewing necessarie is based on an old sewing pocket found at a flea market several years ago. In days gone by, women would carry these neat little roll-ups with them because they would contain thimble, thread, needles, pins, small scissors and other necessary sewing and quilting items.